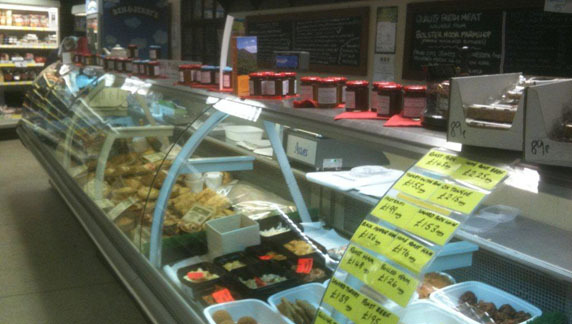 Our 10 metre run of fresh foods include the award winning sausages and meat pies from Bolster Moor Farm Shop, a delicacy in themselves and second to none for quality and flavour. Our choice of mixed olives, capers, smoked and plain anchovies are a real temptation for the true epicurean too! We boast a wide range of English and Continental Cheeses which include locally made Shelley Brie, again an award winner in 2010 and a real match for the French producers! Our regional cheeses are supplied by Carron Lodge of Preston, a company we have dealt with for over 40 years. There own, farm made territorial cheeses are extremely popular and are suitable for vegetarians too, with no compromise of flavour at all. A rich, nutty mature cheddar and a true authentic smoked Wensleydale being two of my favourites as well as being best sellers on the counter. Moving along, you will notice a selection of freshly made Pates supplied to us from a Welsh firm, Patchwork Pates. We have a number of popular variants on display at all times but for your convenience and at a marginally reduced cost, we offer a selection in the freezers of both the 150g and 1kilo sizes. Home Farm Foods have a few decades of experience in sourcing and supplying most of our tasty slicing meats. A local, family run business which prides itself on quality and service which is of course synonymous with Taylors. To compliment this range of over a dozen choice meats we also roast our own Ham and Beef, a true old fashioned, through –roasted method, not pre boiled, which retains flavour, texture and not excessive water! All these choices of fillings will no doubt inspire you when selecting what to have in your tasty, freshly made sandwich. We pride ourselves on the volume of sandwiches we make in a week (well over the thousand!) and although you may have to be a little patient as they are all made to order and to your own specification, they are well worth waiting for! We get asked for some weird combinations but we are here to please: we don’t have to eat them !! Finish your lunch off with the best selection of home made cakes and pastries you will find in town! Three of our Deli Dollies are extremely competent ‘bakeresses’ and offer a range of calorific delicacies which are mourish to say the least!